At our neighborhood train station my son and I heard lots of frantic chirping then saw a baby bird on the concrete ground. It appeared to have fallen from the wooden eaves high above. 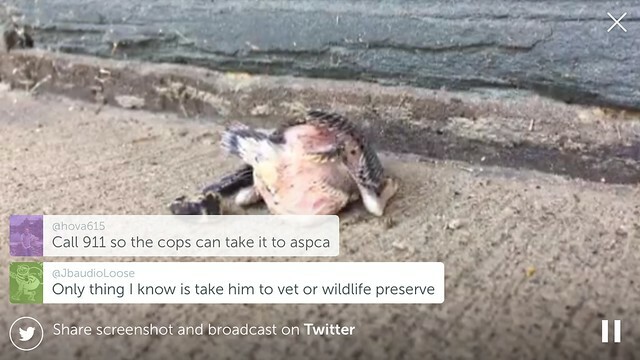 I started a live Periscope stream and solicited suggestions from tuners-in :"put it back in nest", "give it worms", "call 911". Someone encouraged me to take it I to the wildlife rehabilitation I had mentioned. And so I did after my son boarded the train. At the center, the receiving rehabilitator examined the bird, identified it as a plump baby sparrow, said that it was a little splayed but its wing were not broken, and that it would have lots of brothers and sisters for company because people had brought in about 20 some such babies in recent days. It will be cared for until it can fly and be released back into nature. 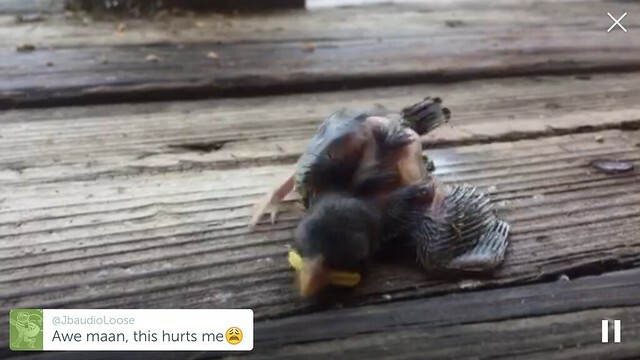 Two days later I called back with the case number I had been given and learned from the woman who accepted the patient, that baby bird 2540 was doing just fine. Watch shorter video here. Watch longer video here.